Westeros is a troubled land. A sprawling continent, littered with Houses and Clans and centuries-old strongholds, with a rich history. The land used to be divided into 7 kingdoms, with 7 kings, but 300 years earlier, the realm was united by Aegon the Conqueror, of House Targaryen, a family known for their dragons, their unique look (silver hair, purple eye color), and their madness. 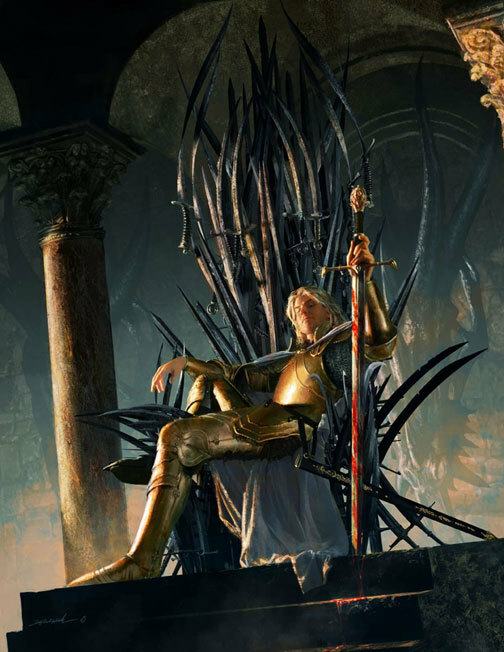 But Targaryen rule was finally put to an end by a headstrong, passionate man named Robert of House Baratheon, who killed Prince Rhaegar Targaryen in a famous battle at the south fork of the Trident River, while back in the capital city of King's Landing, the mad King Aerys was killed by a member of his own personal guard, Jaime Lannister. Confused yet? Well, take heart - this is just the barest tip of the iceberg when it comes to the mammoth, incredibly diverse, and - most importantly - eminently memorable cast of characters that flesh out George Martin's epic fantasy tale, which is labeled The Song of Ice and Fire. It is perhaps the best modern fantasy series to be penned - and definitely the best I've read. King Robert is not a very good king. The tenuous unity in Westeros teeters on the brink of dissolution, as Robert drinks and whores and hunts and plunges the realm deeper and deeper into debt. When his chief advisor dies, King Robert strikes out north to visit his old friend Eddard of House Stark, who fought side by side with Robert back when he won the throne. The King intends to ask Eddard to travel back south with him, and be his new chief advisor. But Eddard is of the frozen North, and the sweltering snakes' nest of King's Landing down south holds no appeal for him. Yet Eddard is also a man of honor, and honor compels him to accept the King's offer, fracturing his family in the process. 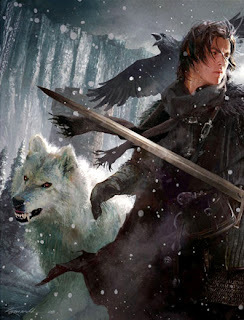 A Game of Thrones is primarily a story of what happens to Eddard and the Stark Household as a result of his decision to go south with the King. 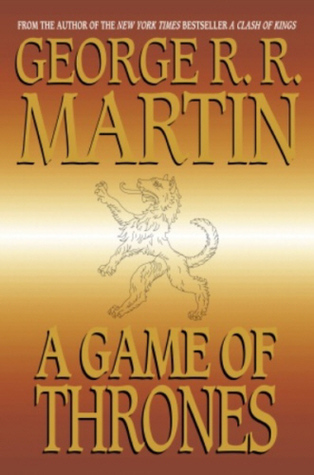 It's not just the stability of the kingdoms of Westeros that is at issue in this series. Far to the north of Westeros is The Wall. It marks the end of civilization. It is a wall of ice and stone some 700 feet tall and traveling coast to coast, built centuries ago using magic long forgotten, and is manned by the Night's Watch. There are things beyond The Wall that require a constant vigil - especially when winter comes. The winters in Westeros are often years long, and bring with it ancient horrors that would gladly spread south if the Wall were to be breached. Ancient horrors that most of the realm believes to be fairy tales, but that the Night's Watch are learning to be far too real. And across the Narrow Sea are the Free Cities, with many other races and peoples and magics. It was to the Free Cities that the last of the Targaryen family fled when Robert Baratheon took the throne. It was his mission to hunt down and kill every last Targaryen, yet two children had slipped through his fingers: Viserys and Daenerys Stormborn. Viserys has designs on returning to Westeros to reclaim the throne that was stolen from his family, and he will stop at nothing. But his madness is his greatest weakness. The cast is as fascinating as it is vast. The dialog is wonderful, the world alive, the action relentless, and the author merciless. I have never read an author who so willingly sacrifices characters, both loved and reviled. As a reader, you learn early on not to grow too attached to anyone, yet you cannot help it. There will be characters you hate, and characters you love, and examples of each that will evolve and morph until you feel the opposite about them. Every shade of "good and evil" is represented, with very few pure examples of either extreme. Everyone is a mix. Everyone is a blend. Every combination of good, evil, smart, dumb, brave, cowardly, inconstant... there are no archetypes, only people. I cannot get into specifics of the story itself without launching into a full-scale, fully detailed summary, which would be boring. In the interest of brevity, let me say this: I highly recommend this book. If you love it like I do, then reading the next several volumes will be a no brainer. If you are put off by the occasional salty language, the occasional adult situation, and the over-abundance of violence, then the series won't be for you. Summary: 5/5 if I could rate it higher than a 5/5, I would. Masterful writing. An incredible tale, an alive world, a memorable cast of dozens (and dozens)... in short, a gritty, fascinating, page-turning literary accomplishment. The series is projected for 8 books, with book 5 on sale soon. I sincerely hope to see the ultimate completion of the series. I guarantee this one will stand the test of time. 8 books? Did GRRM change his mind from 7 and I miss something? Great review, Dave. 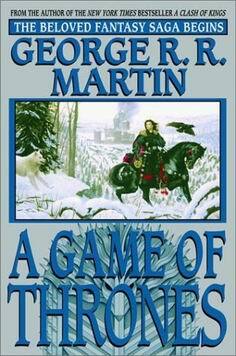 It's been a long while since I read GRRM, but I still remember his scenes vividly. So many, literally, breathtaking scenes... It was Martin's relentlessness & ruthlessness that led me to reading the books in the first place, to prove that I wouldn't get attached to any character. That didn't last long, but regardless, I was hooked. Can't wait for ADWD this summer. Already pre-ordered and waiting for me. Logan, I don't know how to craft links in the comments (like you have done in the past), otherwise I would link to a thread in the Amazon forums for A Dance With Dragons, where a forum member did the research on the history of Martin's plans for the series from the beginning, as far as how long the series was to be. If you go to Amazon, go to ADWD, scroll down to "current discussions" and then hit "see all 116 discussions..." you'll find about a dozen threads down a thread called "Seven Volumes? Or More?" it's a very interesting read. Bottom paragraph starts with this: "GRRM has already been reported, in late 2010, as saying "7 or 8" books to the series." That's where I got the 8 number from. I'm gonna get the digital version the day it's available, for sure. BTW, my sorcerycraft is the simple HTML that I know. Check out this link if you wanna learn. It's simple and takes minimal effort to make your posts COME ALIVE! Midlife Ramblings Ahead! Steel Thyself! My 500th Post. Oh, the Humanity! I Can Tackle Anything! Bring It On!